I hate to be a total killjoy here, but don't you ever wonder what the hell happens to all those errant balloons sent off into the sky? Do you think they just keep going out of the earth's atmosphere and travel into space? Well, they don't. They travel for miles and then land back down on earth, usually semi-inflated or popped into pieces. If a balloon lands in the ocean it creates a great risk for marine wildlife, particularly marine turtles and seabirds. They mistake the flotsam for food (like a jellyfish) and swallow the pieces or get tangled up and drown. Some whales and dolphins have died after eating balloons as it blocks up their digestive systems. It's bad enough that all that crap lands back on the earth, but the fact that it endangers some of my favorite critters is really disturbing. Anyway, if you would like to learn more about how released balloons are a danger to wildlife and the environment, read this. A bill was filed here in NH to ban the release of balloons with a fine of $250? but it failed in the House (I think it was the house). The people who put the bill together were a bunch of area kids out to protect the enviroment. Excellent! Yet another campaign I can add to my list.. Also, you have led me to discover Natalie Dee's comics, and in turn to procrastinate for hours on end, but I am ever grateful! Whether it’s the impact upon wildlife or an increase of littering within the country-side, the views of many are causing an impact on local balloon companies. USA state bans, event cancellations and campaigners are all adding to the media interest about the waste produced from mass balloon releases. In Concord, Massachusetts a bill has been passed classing balloon releases in the same category as littering. 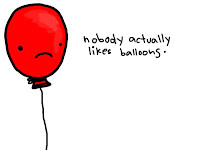 If imposed strictly, a single balloon released into the atmosphere could impose a $250 fine by the ‘balloon police’. Two e-petitions have appeared on the downing street web site within the last month. One requests a total ban and another in favour of banning foil and plastic products being released. An “Eco-School” in Scotland has been praised by the “Marine Conservation Society” for cancelling its annual balloon release after being educated on its environmental concerns. The MCS produced a fact pack titled “Don’t let go” campaigning an end to death by balloon indigestion. While the UK rivers network have advice for event organisers offering alternative balloon fundraising ideas. While the balloon industry has known and some shunned the wildlife impact, the increased awareness from major organisations has seen a shift to identifying a problem. The Balloon Association now gives blame to weighted or incorrectly inflated balloons not reaching a 5 mile height, It’s at this point a balloon will become brittle and shatter. Balloon company that promotes balloons to stay grounded and not released. May I also point out the danger caused by balloons to the many people with Latex allergies, including myself. The balloon causes a severe allergic reaction where the throat swells and closes(anaphylaxisis). The person can die without emergency treatment and the condition is becoming more common. People do not seem to take this seriously and have the mentality that balloons are harmless brightly colored toys for children, but for us they are a menace!